I have had a good, diverse number of species here, mainly using the actinic light in the porch. A Twin-spot Carpet was a first for me last week, despite it being down as common in my ID books. 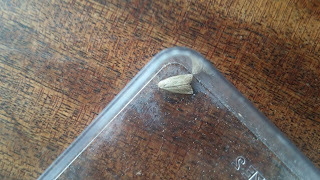 I am struggling to identify this tiny micro moth so any help much appreciated. Your posting just came up in the last couple of minutes - so a lucky, quick response for you Sally! Your micro is actually a small macro - a marsh oblique-barred. Several recorders have been having this moth this summer. Many thanks Ian, much appreciated and no wonder I couldn't find it.